The first attempt to colonize Australia was part of a great and beneficent change in the criminal laws of England. People were turning away with horror from the reckless sacrifice of human life that had characterized the administration of justice in “Merrie England” which had hanged two thousand persons annually throughout the reign of King Henry VIII and even more in the time of Queen Elizabeth. Judicial cruelty, which often boiled a man alive in the streets of London during the time of Shakespeare was continually called upon to commute the death sentence to one of banishment for life. In 1783 a bill was passed by the English Parliament for the transportation of offenders to some place “beyond the seas”. Viscount Sydney was the Secretary for the colonies in William Pitts Cabinet he organised a special vote to provide the necessary funds for this venture. Where would this colony be? Well, Capt. Cooks voyages had just been published and attracted a huge amount of attention. After much discussion Botany Bay was decided as the spot for the new colony. In 1786 advertisements appeared in the English papers for a number of ships to be chartered for this unusual service. They were required to carry about a thousand persons with all the implements that a colony could want as well as provisions for two years. Care was taken in the selection of a commander and thankfully it was Capt. Arthur Phillip. His long training in the Navy had given him discipline and method and yet he could feel for the exiles under his care. How much of the ultimate success of the plan was due to the calm and even mind of Arthur Phillip. JAMES WRIGHT, First Fleeter, was born in 1762 in Maidstone, England. He was a baker, store keeper, publican and farmer At the age of 21 he was charged on three separate counts of highway robbery in the parish of Greenwich, tried in Maidstone at the Kent Summer Assizes of 1783 - he was found guilty and sentenced to be hanged. Fortunately his sentence was commuted to seven years transportation to Africa. But he was not sent to Africa but remained in prison on the hulk Censor for 3 ½ years before he sailed on board HMS Scarborough from Portsmouth along with fellow prisoners for transport to New South Wales. On arrival at Sydney in 1788 James was employed as a baker to Governor Phillip. He held this position for three years, he was then appointed Government Baker at Parramatta. He continued as Government Baker for another 17 years as well as keeping a provisions store. September 5th 1795 two pairs of millstones arrived in the colony one was erected on the site of the existing Observatory and the other one in Parramatta. Terrible difficulties were endured by our early settlers, they had great courage but limited experience, farmers were faced with endless trials in the numerous failures of crops often the result of inexperience and, of course, no guiding records. The seasons were unfamiliar, rainfall, soils sunlight, wind, temperatures all of these demanded a different approach to farming in England and could only be determined by painful experiences. The conditions of sowing, planting cultivation and harvesting were gradually altered after these failures and, in response, a stable system eventuated. Their courage and ingenuity in this new land is to be admired, life was tough. “At Port Jackson On 29th December 1790 James Wright, Robert Bayles, Edward Jones and William Whiting were charged with being up late and creating a disturbance. James Wright was required to forfeit two pounds of flour from his next week’s rations.” He must have mended his ways as he was a member of the Parramatta Loyal Association in 1805. Governor Hunter conceived the idea of volunteer militia groups and Governor King determined to use them as a deterrent to the growing restlessness of the Irish convicts and exiles who numbered about 600. In September 1800 Governor King required all respectable citizens to assemble in Parramatta and Sydney. From those who attended 50 were chosen to form two armed militia companies designated Loyal Association. Richard Atkins was appointed captain of the Parramatta Company. In return for their services the men were provided with arms and uniforms by the government and victualled from the public store. Drill was taken every Saturday afternoon by sergeants from the corps. A list of the Parramatta Company included the names of John Jamieson, D’Arcy Wentworth, James Larra, Zadoc Pettit, James Wright, John Weavers, William Goodwin and Humphrey Thorn. James leased 42 rods in the township of Parramatta in August 1804. His rent was 10 shillings per year for 14 years. It was a mixed farm with 3 horses, 3 goats and 7 hogs, he also grew Barley, Maize, fruit and vegetables. James Wright employed two men to help with the work. In 1811 he received a spirit licence and kept a hotel at Parramatta named The Cottage in the Grove, located between Duck Creek and Duck River on the western side (Sydney Gazette 12/3/1829). He also established another inn, The Farmers’ Arms in 1840. In 1820 Governor Macquarie granted James 60 acres of land at Duck River on the Parramatta Road. He took 3 years to clear 15 acres of the grant and 12 of these were under cultivation. He had also built a substantial house on the property for his wife and family. James was the victim of numerous robberies after he had established a comfortable lifestyle for himself in the colony. (ironic as he had been charged with three counts of Highway Robbery). One of the thefts was surprisingly solved; once his silver watch was taken, and although he advertised, the theft the watch was not recovered. About a year later a customer came into his shop and wanted a loaf of bread. The customer complained he had waited a long time and James asked him how long he had waited, the gentleman pulled out a silver watch and James recognised it as the one stolen from him. His eldest son, George, married Mary Tarlington in 1815 and George became a Solicitors clerk at Parramatta. Jane married Peter Louis Bemi, a surveyor from Sydney in 1827. John, a convict, arrived in 1812 on board the Guildford. He entered the employment of Governor Macquarie at Parramatta, received a pardon and became overseer of the gardens at Government House Parramatta from 1814 -1821. He was granted 50 acres at Prospect. James Wright, my First Fleeter, died after a short illness on 15th October 1825, he is buried at St. Johns Cemetery Parramatta. Section 1, Row I. The ceremony was performed by J.Kenyon P.C. Shepherdess and her mother Letitia died in the successive years and are buried with James. Shepherdess died in childbirth. Shepherdess and John Agland had three sons: William 1819, James 1822, John 1824. When she fell pregnant again and gave birth to a daughter on 1.6.1826. her husband, John Agland, said he was not the father, claiming that John Piesley was. When Shepherdess died in childbirth he gave the baby girl away to Anne Long who, when the child was 1 year and 9 months old, admitted her to the Parramatta Orphanage. This explains the reason why Shepherdess was buried with her parents. Her little boys were so young 7, 5 and 3 years old. They must have wondered where their mother and baby sister had gone and no doubt asked their Father many times. 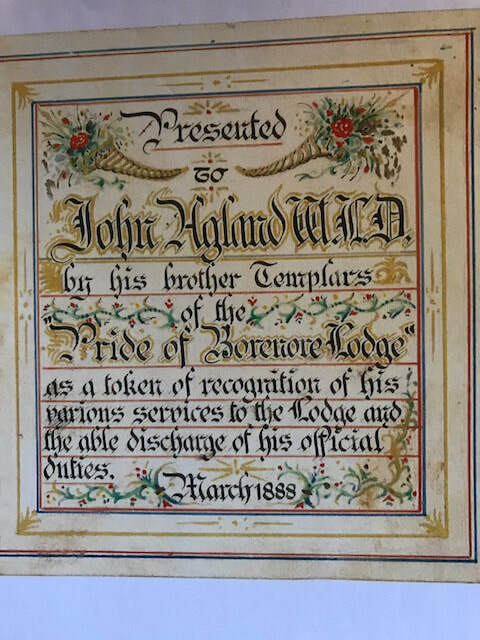 On his death in 1861 John Agland did not leave his estate to his children but left all his possessions to one of his Grandsons, also named John Agland. This grandson John Agland was born in 1844, married Isabella Kidd born 1846 - they are my Great Grandparents. John and Isabella went to school together so I suppose this could be called an early Australian school yard romance.